Every Thursday morning 19 Kelley School fifth graders arrive at school an hour early for a 40-minute practice playing a unique percussion instrument--a five-gallon, royal blue plastic utility bucket. They make up the “Bucket Brigade” and these young musicians raved January 12th, 2017 about the unique, rhythmic and loud brand of music they’re making together under the daring direction of Cynthia Briggs, Kelley School instrumental music teacher and NCSD Music Department Leader. Students play their buckets--that last year were filled with chalk used to stripe the Newark High School athletic fields before Briggs obtained them--with drum sticks. Notes for this distinctive music genre are played by reading sheet music and making strategic hits with their sticks to the head of the inverted bucket, the rim or the sides. Others for this one-of-a-kind music are made by stick clicks and hitting the nearby floor. Looking for something new and different, Briggs formed the first “Bucket Brigade” during the 2015-16 school year. 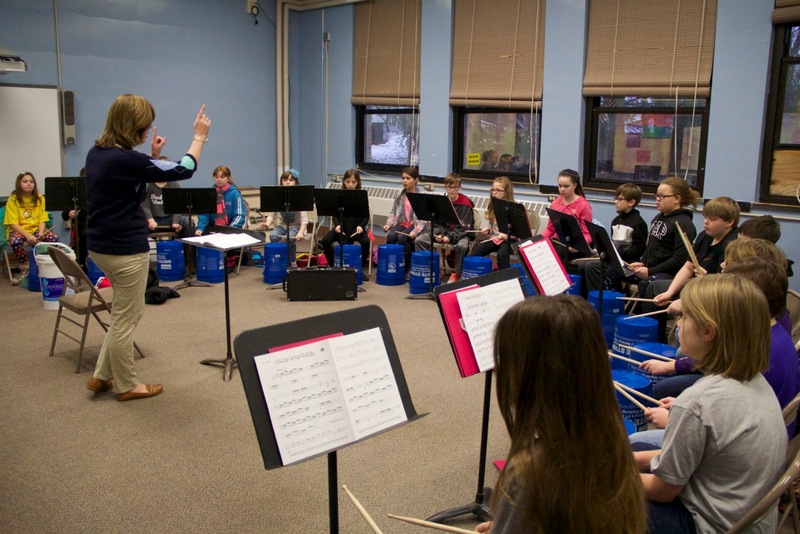 She said the fifth graders last year were equally enthusiastic about making bucket music once the initial, challenging learning curve for both she and her students was behind them. Bucket Brigade members--both this year and last--had to sign a contract promising to attend every single 40-minute Thursday morning rehearsal unless they were sick. And that’s quite a commitment because the other requirement to become a Bucket Brigade musician is that each student must be a member of the Fifth Grade Band. Which means each of the 19 students must come to school an hour early three mornings a week, not just one. “This group of students are here because they want to be,” Briggs emphasized during rehearsal January 12th. Because each and every member must play in such a coordinated, precise fashion, practice, in this case, is essential. 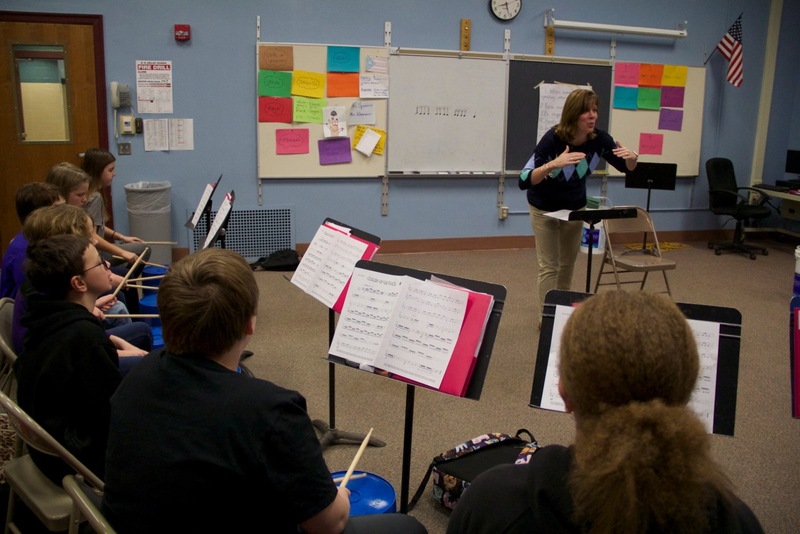 “Students have to be really focused and concentrate because if one person makes a mistake it is very noticeable--much more so than it would be in band,” Briggs said. But the youthful music makers--16 of which play non-percussion instruments in band, say it’s worth it. And they also practice on their buckets at home. Some noted, however, that because of the noise, their parents require they do so in their bedrooms or the basement of their homes. Milleniyah Glanton noted her dog hides behind her mother when she practices. But parents of the students who saw them perform for the first time at the Kelley School band concert in December were impressed with what they heard. They’ll get another chance to hear the students perform at a concert in June and possibly at another community event. AJ Comella, who plays the tuba in band, enjoys playing the bucket. “It’s rhythmically different and I like the different sounds,’’ he said. Beatrice VanRiper, who plays the flute in band, said she enjoys bucket music because “it’s cool” and she likes the way it sounds. 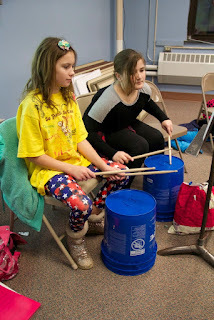 0 Comments to "Bucket Brigade Musicians at Kelley School Love the Sound"